Well, let’s call this a learning experience, and a perfectly nice way to spend a Sunday evening at home. Despite my best efforts, I quickly realized upon beginning this recipe that I am grossly underqualified to attempt such a delicate, traditional dish as this. However, that’s the entire reason that I am on this cooking adventure in the first place. What would likely take a trained chef only minutes to make, took me a shameful amount of time to assemble. (Forming the bacialli took 3 episodes of Cosby on Hulu…not that I’m complaining!) I cannot wait to take cooking classes when we get to Italy! In the meantime, I’ll keep making massive messes in my kitchen, and being forever indebted to my darling hubby who graciously tries every recipe without breathing a word of negativity or dislike even when dishes turn out to be complete flops. On top of it all, he very often does the dishes for me! While the flavors were good, my execution was not without flaws. Oh well! There’s always tomorrow. P.S. This is my 100th post…Thanks for reading! This dish is typical of the Liguria region in Italy, according to my new favorite cookbook, La Cucina. It contains over 2,000 recipes. How on earth will I ever decide which ones to make? For now, it’s fun to just close my eyes and point to a page. 2. Form the dough into thin cylinders then cut them with a knife into pieces about 1 inch long. 3. Using your thumb, press each length of dough against a floured fork, then let it fall onto the work surface. When all the bacialli have been made, cover them with a cloth and let them rest. 4. Heat the olive oil in a medium saucepan over medium heat. Add the onion and mushrooms and saute until the onions are golden. Add the tomato paste mixture. Stir in the red wine, if using. Add the broth, reduce the heat to low, and cook very slowly, stirring every one in a while, adding a little more broth if the mixture dries out. 5. 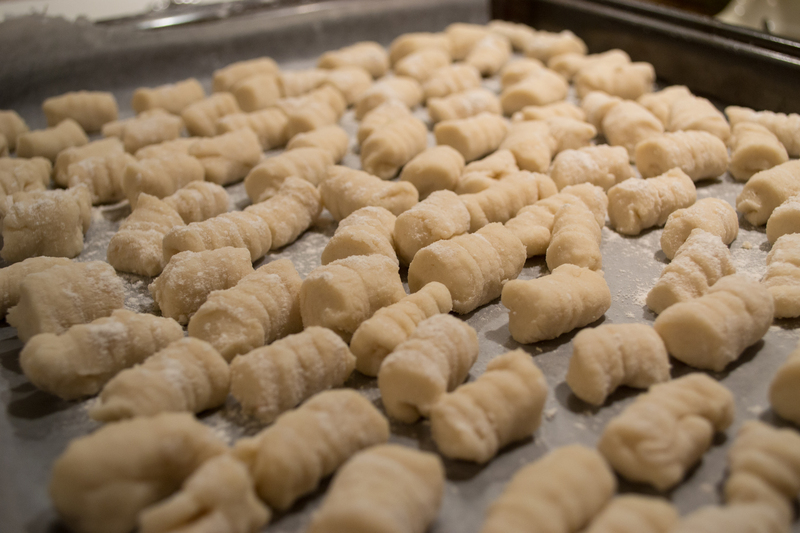 Cook the bacialli in boiling salted water; as soon as they float to the surface they are done. 6. Drain them with a slotted spoon and arrange them in a deep serving dish, alternating layers of them with the sauce. If desired, the plate can be completed with a sprinkle of Parmigiano-Reggiano.